We were first introduced to The Tarla Grill by another set of bloggers @originalNFV. They were to blame for me seeing the beautiful dishes from The Tarla Grill and making me want to go there. They often repost The Tarla Grill’s content on social media and it ended up in my stream. I’d also like to say a kind thank you out to our friends @originalNFV as they have been some of our biggest supporters, helping to get the word out about our blog. It was a hot day in Napa. Oh man, it felt like the sun was biting our skin as we walked the short distance from the car to the restaurant. I was so thankful to enter the cool, pretty restaurant. 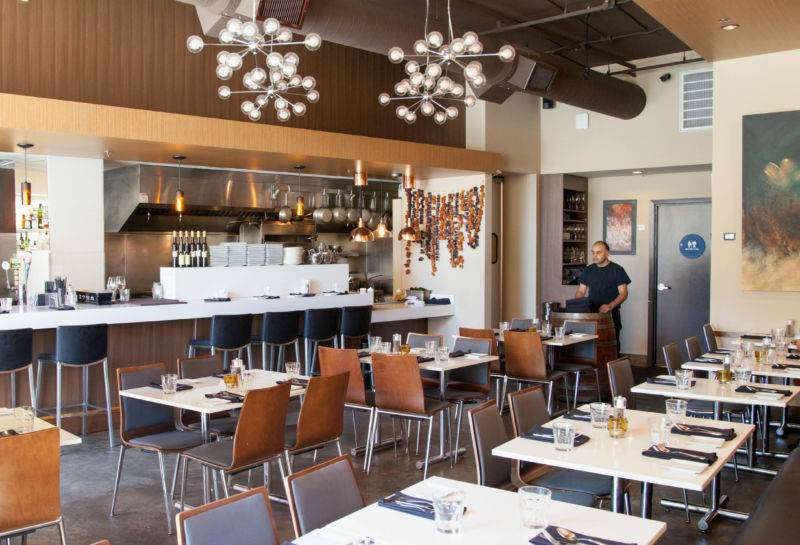 When we arrived, the restaurant was fairly empty except for two other tables. After we sat down, it quickly filled up with hungry diners. I can see why. Our waiter was excellent. He was prompt and gave amazingly good and charming service. Even when the restaurant started to fill up, we still felt attended to. Another waiter cleaned, cleared, and refreshed drinks constantly. The Brit comments: Taking advantage of a wine list that offered a varied and unusual selection of wines by the glass, I ordered a Turkish red wine called Okuzgozu. We ordered the Greek Dip Trio to start our meals. 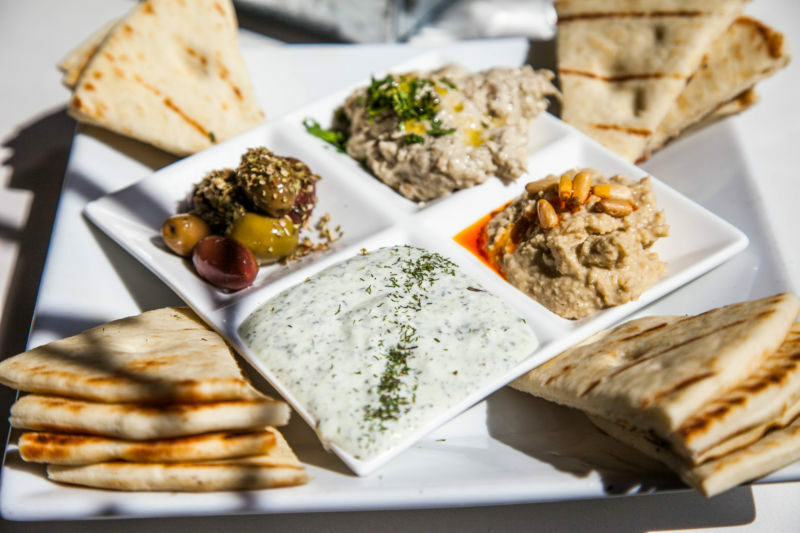 Who doesn’t love tzatiki, humus, and babaganoush? 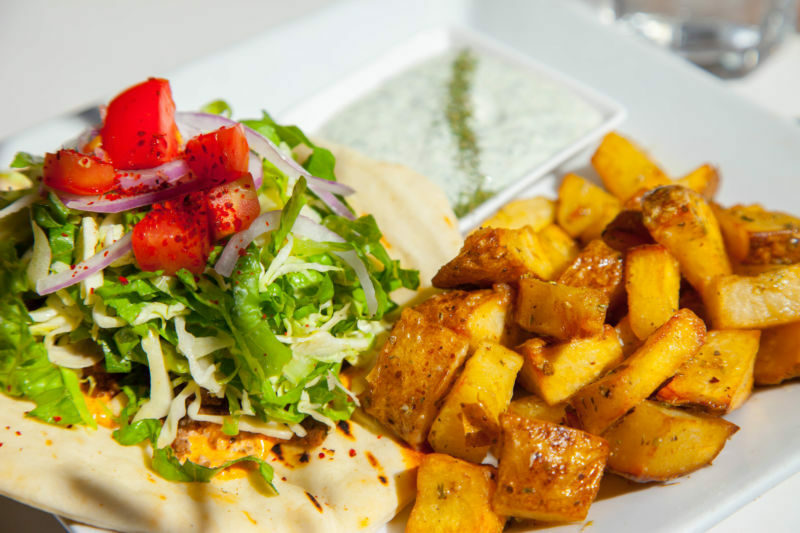 Served with warm pita bread and you have a slam dunk for yummy. 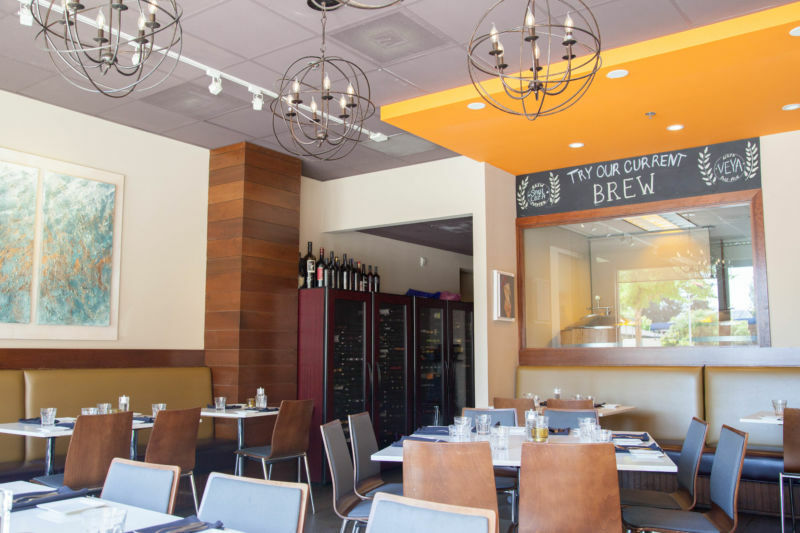 I loved their version of babaganoush. Mmm, it takes me back to our time in the Middle-East. Delicious! I thought the tzatiki and the humus were both good quality and tasted fresh. The hummus was slightly more chunky, which I liked. For our main courses, I ordered the beef gyro, and The Brit ordered a lamb burger. Both were served beautifully and smelled like heaven. I like that they put feta cheese on the lamb burger for that extra touch. My beef gyro was absolutely delicious. It was served with a spicy sauce which I was unfamiliar with in traditional Greek cooking. It was almost like a chipotle aioli. I liked the flavor combination but between the gyro being beef and the spicy sauce it felt far more Mexican-esq than Greek to me. I would have liked it be lamb or chicken instead. It was served with small roasted potato chunks that were lightly spiced and finished with rosemary. They were very good, and the seasonings didn’t overpower their flavor. The Brit ordered the winning dish (as per usual). His lamb burger was amazing. It had retained all the lamb flavor and was served tender, juicy, and perfectly cooked. The spicy sauce was served with it too, and it really complimented the flavors of the meat. He too enjoyed his potatoes and ate with gusto. The Brit comments: When I ordered the burger, the waiter offered me a choice of feta or cheddar cheese. I picked the more Greek of the two options. 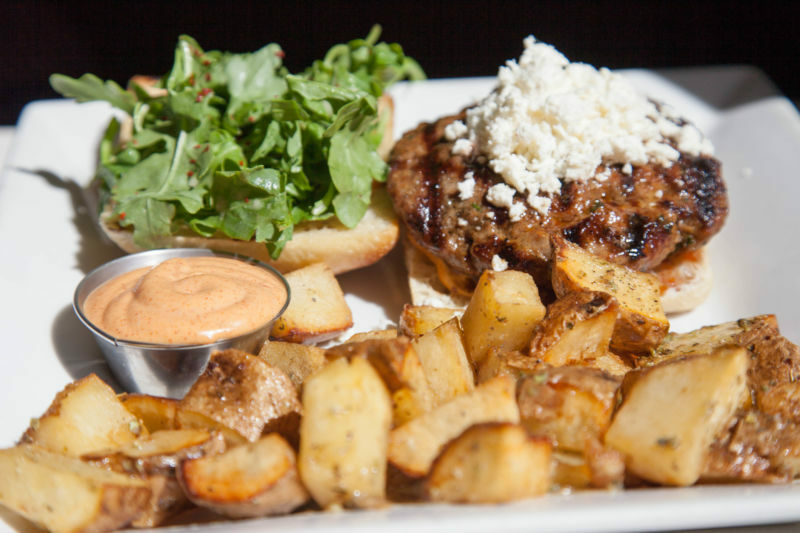 The Feta, the sauce, and the arugula worked well with the meaty burger. The menu had said the dish was served with fries, so I was very happy to see chunks of potato and not the usual thin slices. We were so full from our main dishes we had zero room for dessert. Next time! I can only imagine how good their desserts must be if the food is that good. 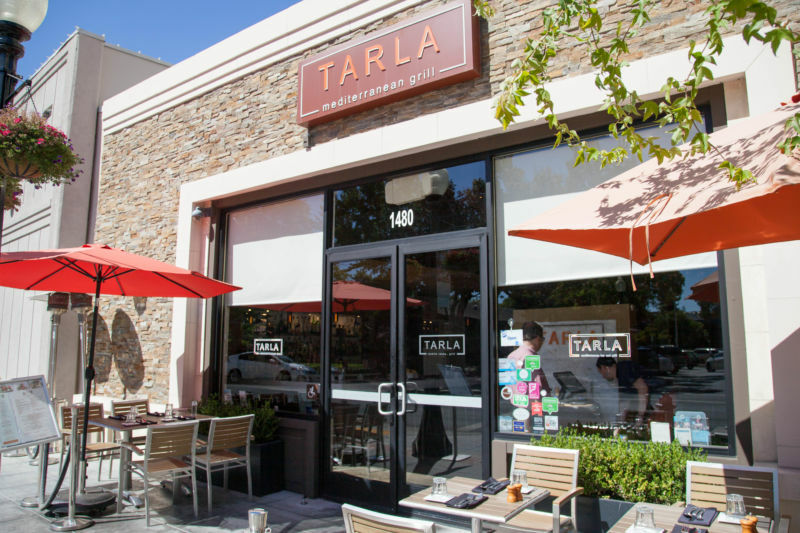 We really enjoyed our time at The Tarla Grill and will be eating there again soon. We give it the big thumbs up!